New photos and a hands-on description have compared Google's custom-built Nexus One handset, rumored to be for sale to the public next month, with Apple's iPhone [updated with hardware specs]. Jason Chen of Gizmodo received some hands-on time with the hardware thanks to an anonymous source. He called the long-rumored, supposed Google Phone a "Droid killer" —ironic, because Motorola attempted to position its Droid, which launched in November, as an "iPhone killer." 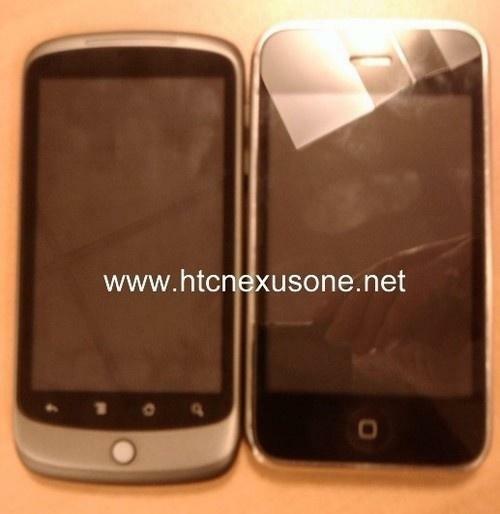 Chen said the Nexus one is slightly thinner and lighter than the iPhone 3GS. The back is somewhat rubbery, and feels less "cheap," he said, than the iPhone's plastic back. "You can call the design the antithesis of the Droid: smooth, curved, and light, instead of hard, square and pointy," he said. "It feels long and silky and natural in your hand —even more so than the iPhone 3GS." Loading a Web page over Wi-Fi, the Nexus One was found to be the fastest of the three phones. The iPhone 3GS reportedly loaded a page "a few seconds later," while the Droid came in third. Chen said the results were consistent with a number of Web sites. The Nexus One screen was described as superior, with "vibrant" colors and darker blacks than its competitors. It was also said to be brighter. In comparison, Chen said the Droid and iPhone screens seemed "washed out." "This is probably the best screen we've seen on a smartphone so far," he said. "Probably." The Nexus One's 5-megapixel camera includes flash, though the picture quality was said to be unspectacular. The camera has autofocus, but does not have the tap-to-focus feature seen on the iPhone 3GS. Google's handset also lacks multi-touch, was said to have mediocre music playback over its speakers, and call quality was not tested. A run through of the Nexus One's interface was also uploaded to YouTube. It shows the speed of the phone and some of its new features. The Web site was also told that the hardware will be available only by invitation at first, though details on how those invitations will be distributed were not known. It also added that T-Mobile will sell the device in the future, reaffirming previous reports. Rumors of a supposed Google Phone have persisted for months, with various reports claiming the device will be made for sale in early 2010. Google supposedly designed the Nexus One hardware, which runs the company's Android mobile operating system, and contracted its manufacturing out to HTC. Earlier this month, Google employees were issued the unlocked GSM phone, which has an OLED screen and runs a new version of Android. Google has been rumored to sell the device contract-free to customers starting in 2010, though wireless carrier T-Mobile is also said to offer a version of the phone under contract.